Hotel Mousai in Puerto Vallarta is a tropical paradise that offers an eclectic fusion of imagination, contemporary design and inventive functionality. Living spaces are redefined for modern appetites, merging minimalist design with aesthetic sensitivity, and afford breathtaking panoramic views of Banderas Bay. 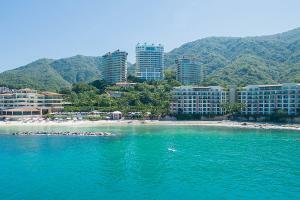 Located in the heart of Banderas Bay on the tropical Pacific Coast of Mexico. The Rooftop, Hiroshi - Japanese gourmet cuisine, The Terrace, Lobby Bar, Blanca Blue - International cuisine, Bocados STK - International cuisine, Aquazul. Bird Watching, Marietas Sea mi Amor, Pirates of the Bay, Rhythms of the Night, Fishing, Scuba Diving, Snorkeling.